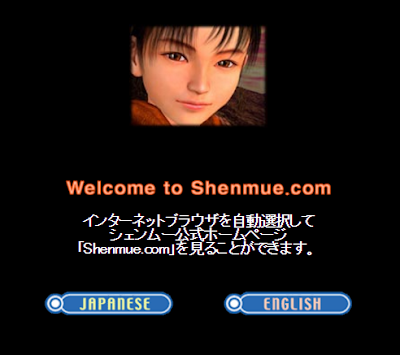 Muecas provided fans with regular information updates, articles and illustrations about Shenmue over a long period of time. 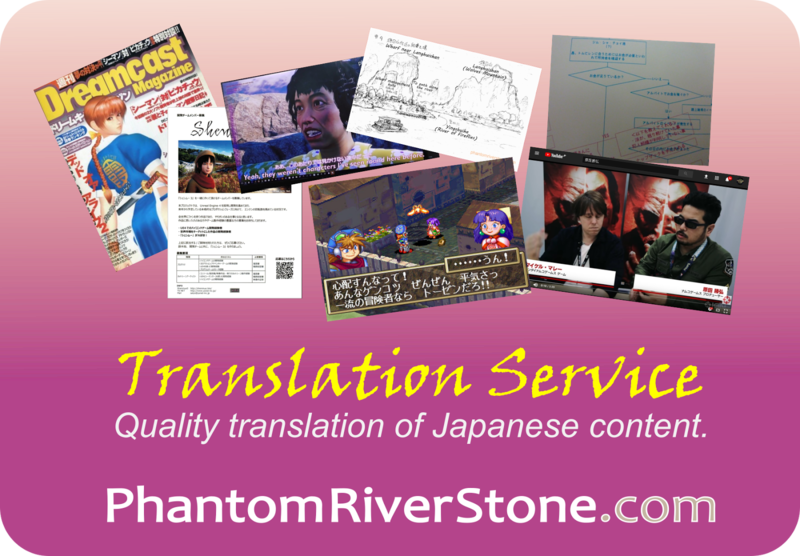 Unfortunately for non-Japanese fans, the content was only available in the Japanese language however. New updates from the Muecas team ceased in April 2004, and the entire Shenmue.com site was decommissioned at the end of 2005. However, although the Shenmue.com site is now long gone, the media images from the Muecas pages were fortunately archived through the forward-thinking action of Ziming from the Shenmue Dojo, to prevent them being lost forever. It is from this archive that today's comic strip is taken. アニィたかはし (Anii Takahashi) who drew the comic was not an official Shenmue project team member, but one of us, Shenmue fans. Muecas-dan was formed by the official Shenmue team to communicate with fans and the fans who contributed to their web magazine were acknowledged as Muecas-dan members. Anii-san was the first fan who got the honor and awarded #011 as a Muecas-dan member. Not only that, but Kiyuu was an official member of Muecas-dan herself, being awarded #023! The Sega editorial staff are shown at the top & fan members below. 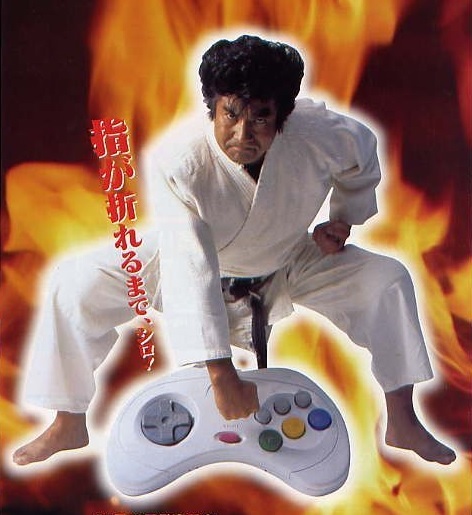 Segata Sanshiro is a fictional character created by Sega who appeared in advertisements for the Sega Saturn in 1997 and 1998, and he became extremely popular in Japan. His mission is to seek out people who do not play the Sega Saturn, and teach them a "harsh" lesson. "Play until your fingers break!" His name and character is a parody of a legendary judo fighter named Sugata Sanshiro, who featured in Japanese director Kurosawa's directorial debut film. The name is also a play on words, sounding similar to the phrase "Play the Sega Saturn!" (Sega Satān, Shiro!) in Japanese. He even had his own theme music which played during some of the TV commercials. 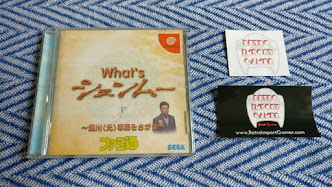 Segata Sanshiro was acted by actor Hiroshi Fujioka, who has a connection with Shenmue since he did the Japanese voice of Iwao Hazuki (thanks to blog reader Jay-El Romeu for highlighting this). And now, onto the comic strip where we join Ryo in a forest in Guilin, with his father Iwao appearing in his imagination. But wait... is it really Iwao? Turns out to be the legendary hero Segata Sanshiro, trudging up a mountain path with that oversized Dreamcast strapped to his back, as his theme song plays. 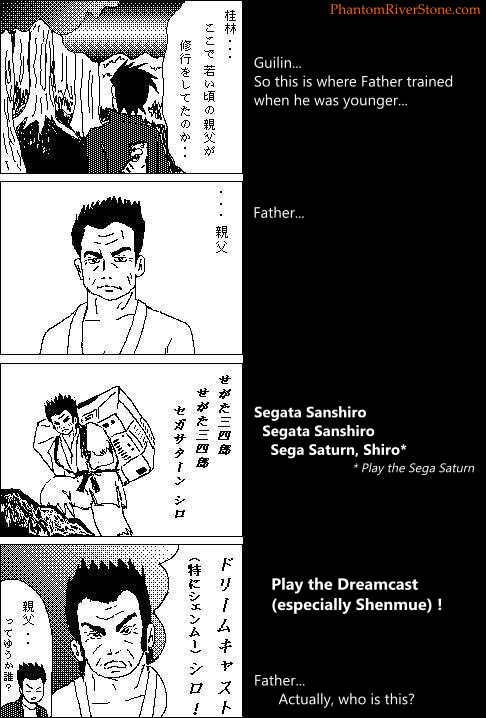 In the last panel, the phrase in Japanese "Sega Saturn, Shiro" transforms into "Dreamcast, Shiro", giving the translation: "Play the Dreamcast" (with special mention of Shenmue, of course!). The archives have many other Shenmue comic strips that should make a fun series to translate and post up from time to time. Watch out for more in the future. Thanks for your comment Robert. 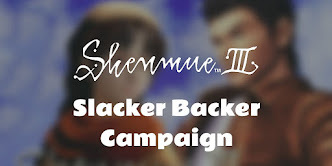 I think you're spot on with your comment around the support from Japanese fans which was apparently strongly tied to the Shenmue.com site (as opposed to the spread of fan sites in English). When Sega closed it down in a few years' time the impact was heavy. Thank you for adding my comment on the Muecas-dan, Switch-san! Oh, I see! So it wasn't actually to do with "Dreamcast" at all. Thank you Kiyuu for this correction, I'll update it above. And also for your support for the blog! Aha, an index of the "Weekly AM2" back numbers. Thanks! It looks like there's a lot of interesting information in there.